Today’s pedal line is from Andrew Foster. If you have a pedal line (doesn’t have to be in a board) for your rig, please email me a photo, bio, description of pedals and routing to pedalline@nulleffectsbay.com. Every Friday I’ll showcase a pedal line submission. Make sure you include any links to your band or music page. Excellent site for us guitar geeks out there and the world of effects is a vast one! I thought id submit my board as it could be one for people who havent got the money for the lovely boutique effects we all want, but i get some great results with them. I recently did a gig in a Theatre that is up on my website to listen to using this board throughout. 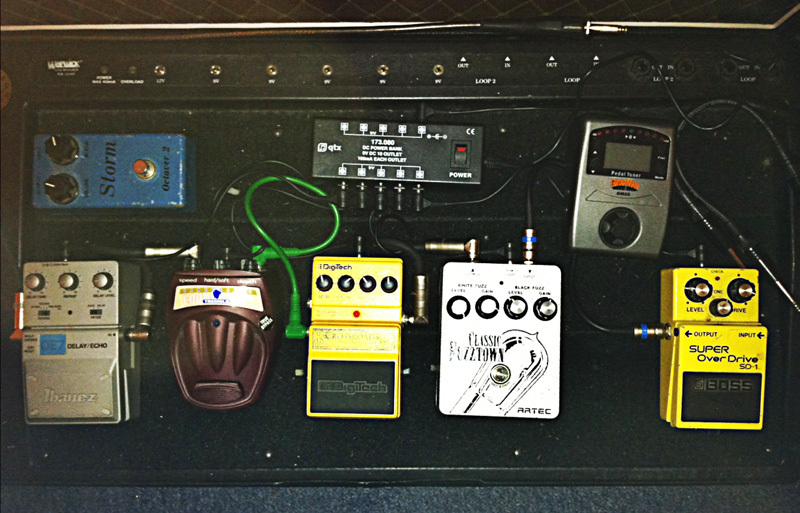 Its the everymans Psychedelic Pedal Board! Tuning although imperative, is something I’ve never understood why people spend £200 on a pedal for. Its not going to sort your terribly set up guitar to stay in tune! This is noise free, extremely cheap, accurate, with a bypass for not annoying the crowd. Job done! We all know what this does! Its the old faithful. I bought this in 1995 and have used it ever since. Its a great pedal for various musical genres and emulates that driven amp sound very well. A stage one overdrive for the start of the chain. This thing is strange! Its a germanium pedal that is a real animal to control. It has some quite nasty top end that needs to be tamed but if you know what your doing with it you can get some really weird fuzz sounds like the ones they used for soloing in the 60’s Psychedelia. Not for the lazy guitarist it completely kills the guitars tone and transforms it into something quite strange, but if you like that, then Fuzz it up! Your mind will be expanded! This little cheap pedal has some gorgeous vintage tremolo tones in it and works great for old skool rock & roll right up to Johnny Marr nuttiness when used in conjunction with an overdrive. Again I’ve had this for years. This is my favourite pedal I’ve ever bought and i swear by it. The range of use is exceptional with all delay tones that you could think of. I prefer and use the vintage echo setting the most as it suits my style of music, but you can get your Edge and Greenwood delays if you wish. Slap back, long Gilmore solos, long repeats its all there with a complimentary feel that doesn’t kill the guitars tone. Now this is something i was hoping Effects Bay could shed some light on! Its the strangest Octave I’ve ever heard with a habit of doing what it wants, but what a sound! Apparently its late seventies, but i cant find any info on it. With one a 9v battery and no power socket i haven’t adapted it yet to the board for live use, but if i did everything would sound like Jack White so maybe i wont! My amps are Vox AC30 vr, Vox AC4 through a 70s Marshall Cab, and a Session Rockette 50. Many thanks Effects bay keep up the good work! It appears that Coron and Storm have a significant relationship. Here is a little more on the Coron Octaver 2.